The dues for 2019 will be collected in December 2018. We could use a Program Chairperson for the coming year, Do we have a member that would volunteer for this position. Remember: Many hands make light work! We also needed a delegate to represent us at the Michigan Genealogical Council Meetings in Lansing six times a year. Charles & Diane Kocher have volunteered to take this position. 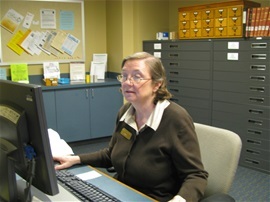 We also have a need for more library volunteers to help in the genealogy room. If you are interested please talk to Mary McManman and she will arrange a short training session for you. With some of our snowbirds going south for the winter months,we could use some more volunteers. We volunteer on Tues, Wed, Thur and Sat, 1 pm - 4 pm. We will be explaining what some of our volunteers do transcribing information at the Clerks Office and what forms they use, Doing Cemetery reading and what is required, Transcribing other information for our society. These jobs are very rewarding as you see the work shaping up and the books made. Thank You to those bringing snacks for our meetings. Thank you so much to those taking tables down at the close of our meetings. We appreciate this help. We hope you will join us at our future meetings. Mary setting up the computer in the genealogy room.